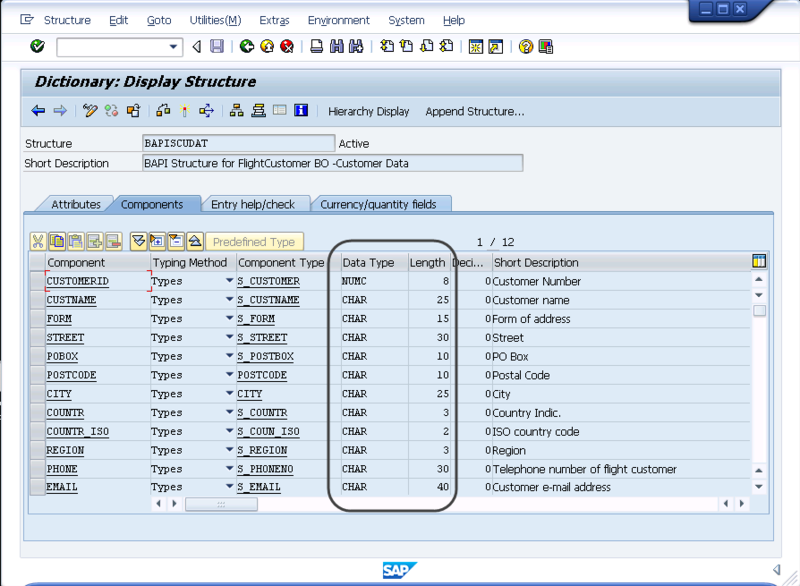 The example illustrated in this section, differs from the one shown at SAP integration example, mainly because: this example here creates a process which is started by the system itself (automatically and periodically), which in turn synchronizes customers in Bizagi as fetched from SAP (creates and updates records of master entities in Bizagi); while the previous example is meant to provide end users with a process that allows them to search for available flights and book one that suits their needs, which in turn commits a transaction in SAP. 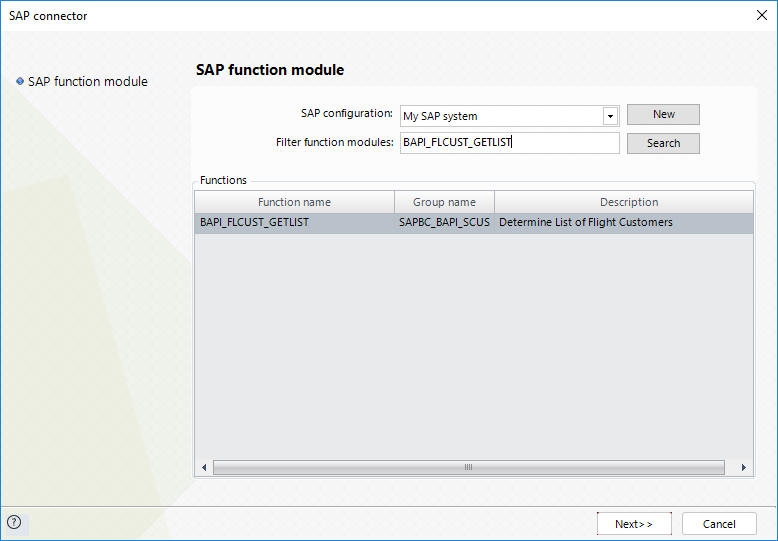 In this example, we will integrate the SAP R/3 (mySAP) Flight Module in a Bizagi process which requires no human intervention. Our goal is to create a process in Bizagi in which triggers on a weekly basis, and populates or updates, the flight customers as available in SAP. For this scenario and when modeling the process, it is important that we set the appropriate properties for the BPMN shapes that support an automatic and periodical execution. Notice we are using a timer as a start event. 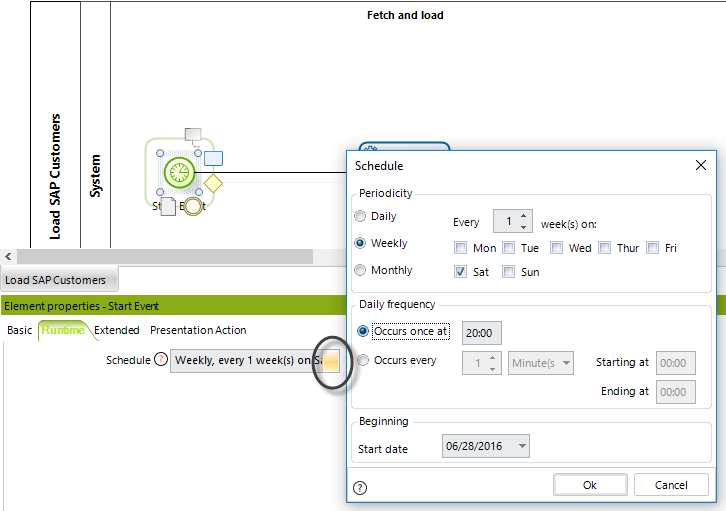 Keep in mind that for a production environment, and especially when planning to synchronize a large amount of records, you will need to plan accordingly such configuration (for instance, scheduling the execution outside of the busy hours, preferably running this at non-working hours). 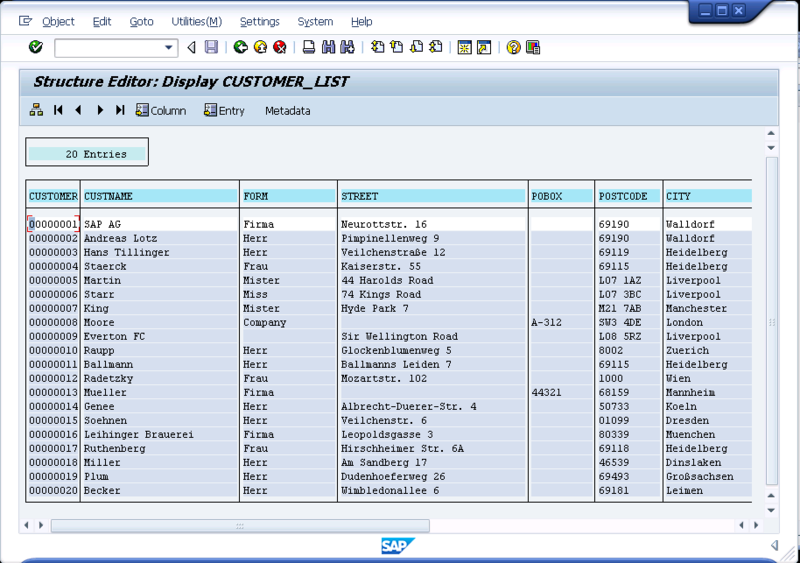 We will look up everything relevant to the function in SAP we integrate, mainly through the options provided by SAP Logon. •Configuration of the BAPI invocation. 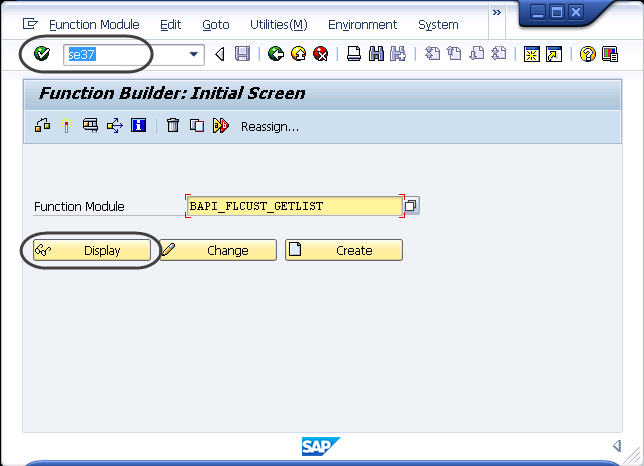 We will illustrate how to configure the invocation of the SAP BAPI from the Bizagi process. 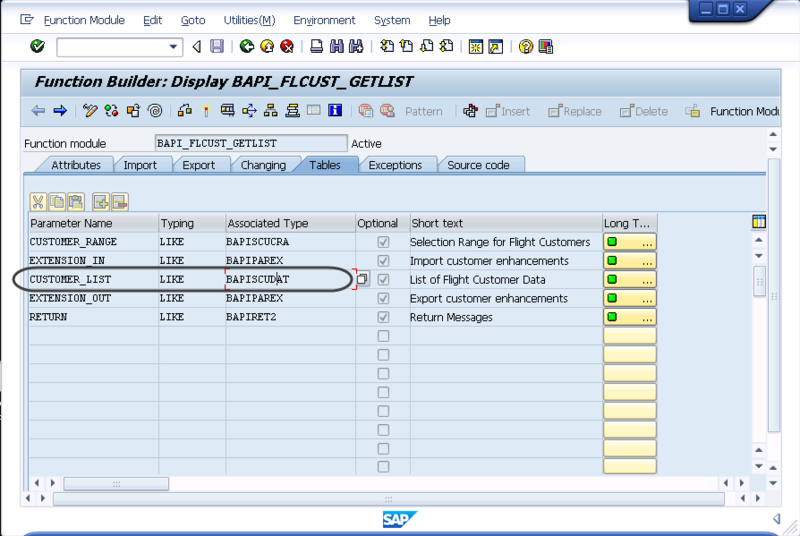 In this example, we invoke the BAPI wrapper called BAPI_FLCUST_GETLIST. 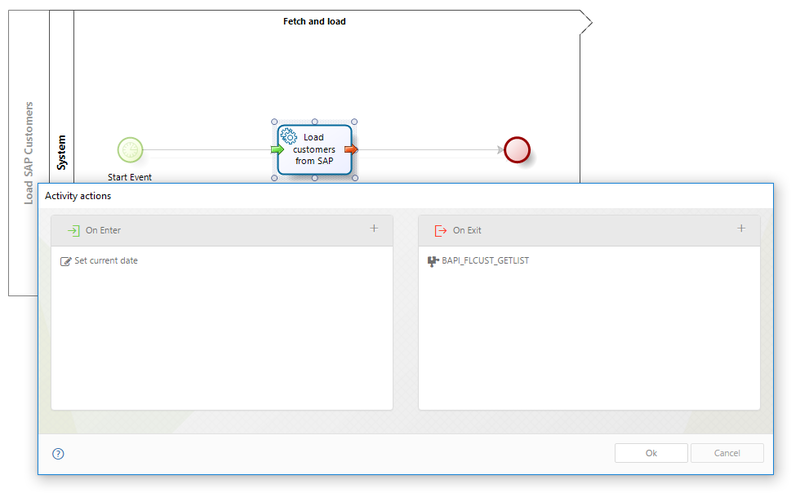 Keep in mind that for the third step to work, you should have already installed the required SAP.NET assemblies, as described at SAP connector (otherwise, Bizagi Studio won't be able to connect to your SAP system). 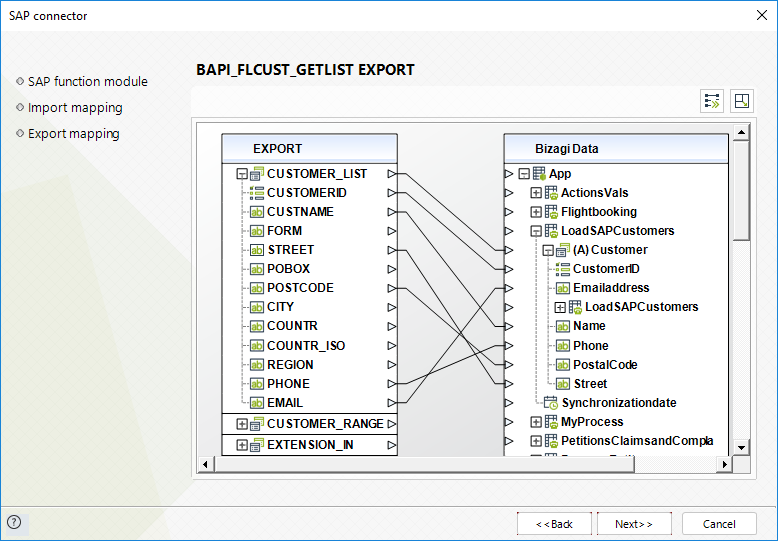 We will need to explicitly identify first, the relevant needed information in order to use the BAPI_FLCUST_GETLIST BAPI in SAP (which information is strictly mandatory in its import, export and table parameters). We use SAP Logon to browse the details of this BAPI. In our example, we will test the results by using MAX_ROWS = 20. 1. For the sake of the simplicity of the example, we will not be taking all information from a SAP flight customer, but selectively use only their: ID, Name, Postal code, E-mail address, Phone and Street. 2. Information from SAP will be stored in an entity called Flight Customer which is of Bizagi's Master type. Note that this entity strictly needs to be a Master entity. If you wish to store information into parameter type entity, then this approach and example should not be used and using Custom replication should be done instead. 3. Our process entity is called LoadSAPCustomers and since entities in Bizagi require at least one attribute, we will use a Synchronization date attribute, useful to store when the synchronization was executed. 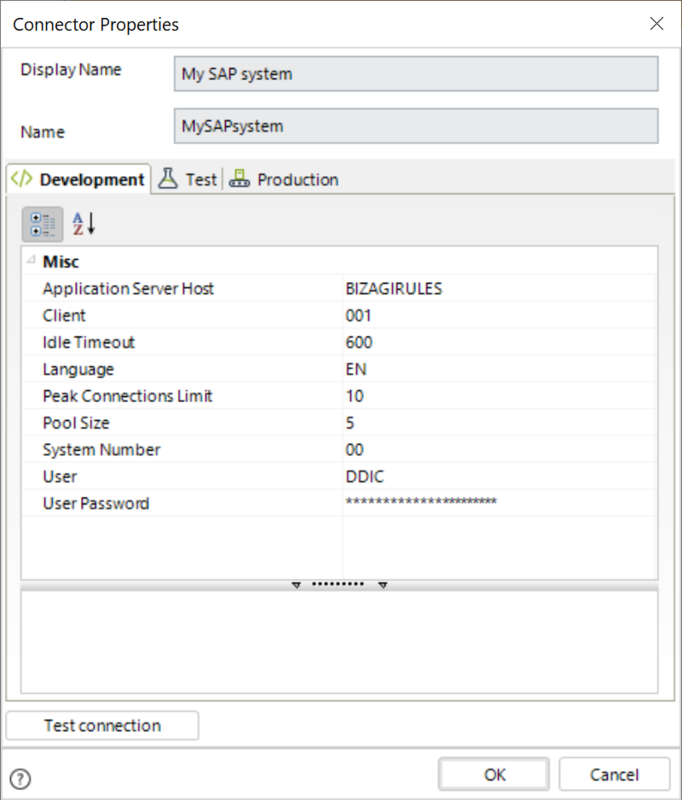 We will integrate Bizagi with SAP in the service task we defined as asynchronous. 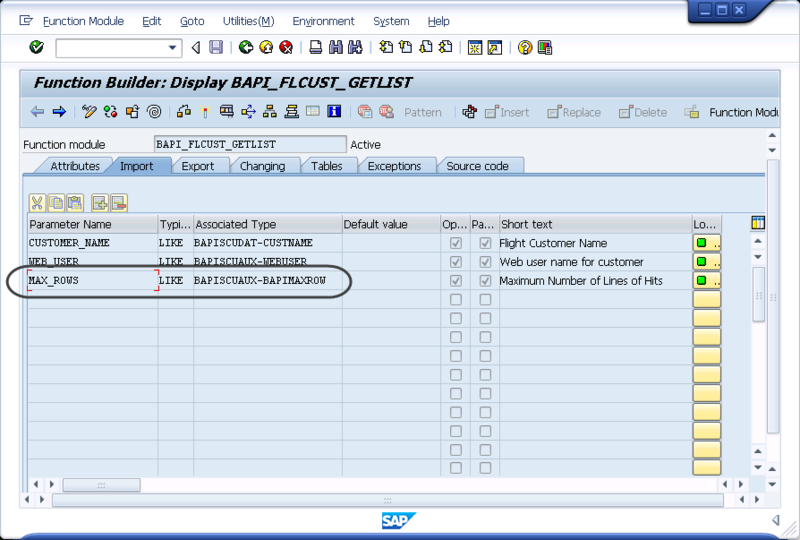 This means that at the Load Customers from SAP activity, we define an activity action at On Exit to invoke the BAPI wrapper called BAPI_FLCUST_GETLIST from the step 4 of the process wizard. 1. 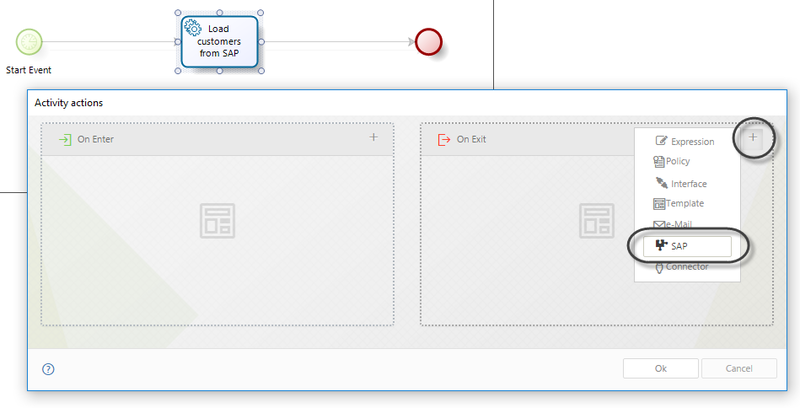 Click at On Exit and add a SAP invocation. Select the BAPI and click Next. 3. Click on the Maximize button to zoom in the inputs configuration. 4. Map the outputs accordingly. 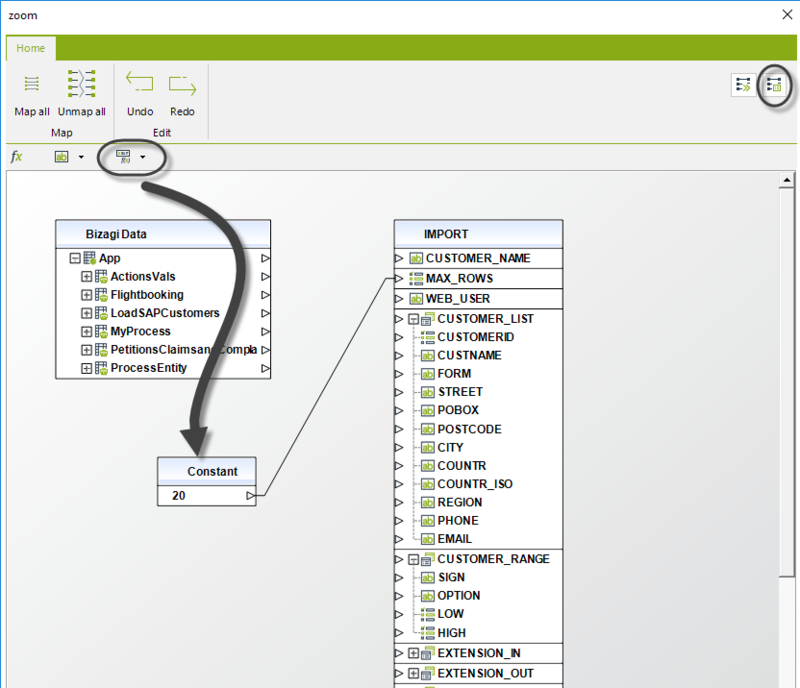 •To make sure you are mapping the response from SAP that is the business key definition in our Bizagi data model (in this case CustomerID). •To make sure you map into Bizagi's Customer collection, by using the default Append configuration for records which is represented with an(A). The use shown above in which we map fields that belong to the business keys definitions in Bizagi Studio (in order to update existing records), will require that such records are already persisted in the database. For instance, this will not work if such information is being handled directly on user interfaces (while residing only in the current scope of the activity). 5. 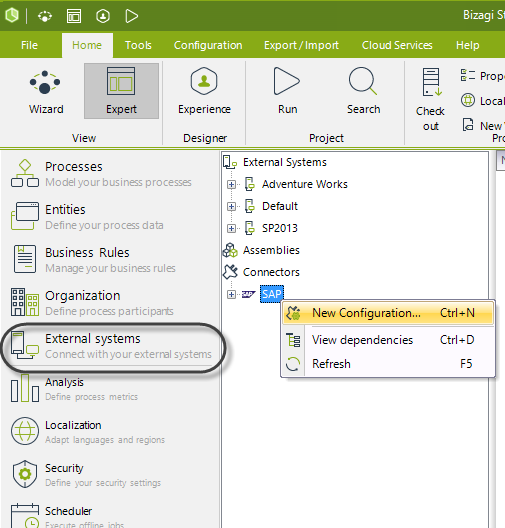 Click Finish to bypass the Error handling configuration and complete the configuration. This is done because this specific SAP BAPI does not have any functional exceptions predefined, and therefore, no special error handling is needed for this scenario. 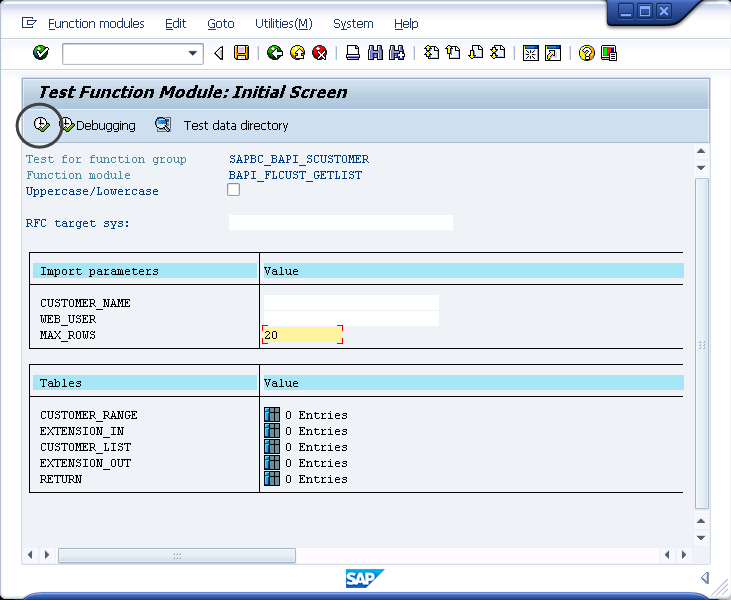 To learn about configuring error handle for SAP integration (when BAPIs have predefined functional exceptions), refer to SAP exceptions configuration. Once this is finished, you will see the Connector BAPI_FLCUST_GETLIST being set. At this point, it is also important to note that because this is an automatic process with no human intervention, it is necessary to make sure that our process entity is initialized. At this point we have integrated Bizagi with SAP through the SAP connector (which avoids the need of programming), and we will fetch and synchronize information from SAP directly and in a scheduled manner into Bizagi. 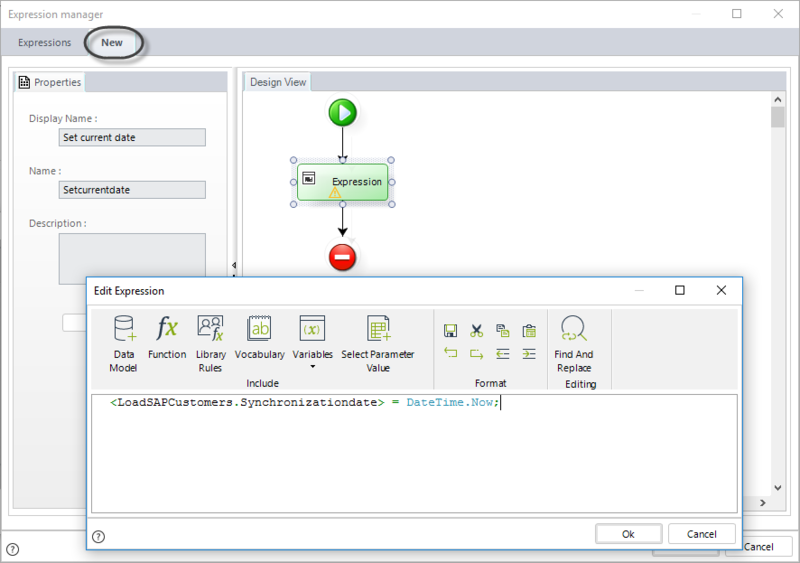 Given the nature of this scenario in which we want the system by itself to run the synchronization periodically, this example is run by the Scheduler service of your Bizagi project and therefore it will fire up once the Scheduler is started and the predefined periodicity is met. 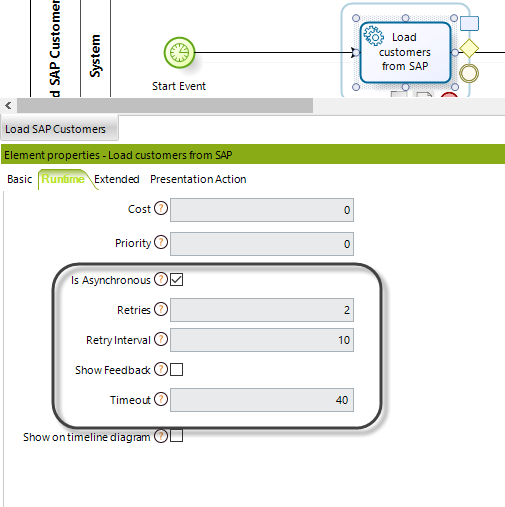 To verify for an update or further executions, you will possibly need to reconfigure the invocation of the BAPI so that you: fetch a larger number of records from SAP (e.g, MAX_ROWS=50), while ensuring that information on some customers have changed in SAP (possibly use BAPI_FLCUST_CHANGE).